New Hampshire is a hit or miss state for gamblers. I say that because I think the legality of online gambling and home poker games are subject to interpretation – you could easily make the argument one way or the other. Ultimately, gambling outside authorized, legal establishments is a grey area. We recommend reading our overview below as a starting point. Is Online Poker Legal in New Hampshire? New Hampshire doesn't specifically mention online poker. The following statutes can be interpreted either way, too, not making for a clear yes or no answer. (d) "Gambling '' means to risk something of value upon a future contingent event not under one's control or influence, upon an agreement or understanding that something of value will be received in the event of a certain outcome. (e) "Gambling machine' ' means any device or equipment which is capable of being used to discharge money or anything that may be exchanged for money, or to display any symbol entitling a person to receive money. The problem that I have here is that, in poker, you have control over what happens. To a large extent, at least. The statute says nothing about total control, or to what degree of control you have to have. However, gambling machine can definitely mean a mobile phone, tablet, laptop or computer. That would technically make online poker illegal. So, like I said, it's not very clear. Home poker games are tricky, too. The reason being is that if you assumed that poker wasn't considered gambling, because poker players have more control over the outcome versus other games like slots, then the following statute wouldn't apply. (a) Permits gambling in any place under the person's control. (b) Gambles, or loans money or any thing of value for the purpose of aiding another to gamble. (c) Possesses a gambling machine. However, if we're misinterpreting the statute wrong, and poker is in fact illegal, then running or participating in a home game would be illegal. Furthermore, if poker is illegal, then staking would be illegal, too, thanks to section (b). A stake and loan is the same thing. Do Casinos in New Hampshire Offer Poker? Yes, there are several casinos and poker rooms. A popular choice is the River Poker Room. This has several poker variations and tables available. We receive a lot of questions about playing poker in the state of New Hampshire. We thought it would be helpful to post those questions and our answers below. Will online poker be regulated in New Hampshire? This is about as clear as New Hampshire's poker and gambling laws. The closest New Hampshire has gotten was in 2010 when Gov. John Lynch suggested that he might support online gambling in the state, namely because of the state's deficit. However, nothing ever came of it. That said, we've read from other portals that I. Nelson Rose, an expert in state gambling laws, said that he expects New Hampshire to be included in the first wave of states to regulate online poker. So only time will tell, I suppose. Is there an online poker room that accepts players from New Hampshire? Yes. Residents can play at any poker site that accepts US poker players. Our top picks include Sportsbetting Poker, BetOnline and Bovada. What other forms of regulated gambling is offered in New Hampshire? New Hampshire runs a state lottery, pari-mutuel betting at licensed racetracks and a tri-state lottery with Maine and Vermont. Charitable bingo, raffles and card games are allowed, too, with a license. Where can I read more about New Hampshire poker laws? Here are some fun facts about poker and gambling in the state of New Hampshire. 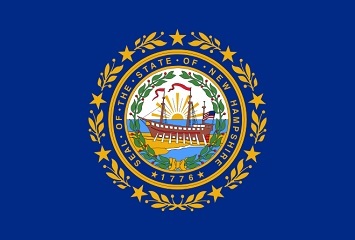 New Hampshire was the first state to introduce a modern state lottery in 1963. Cruise ships with onboard gambling can port up to 48 hours along the state's coast, so long as there is no gambling. Cruise ships which are equipped with gambling machines whose primary purpose is touring. Any such cruise ship shall be allowed to temporarily enter New Hampshire coastal waters and ports for up to 48 hours, provided that all gambling machines on board are not in use or capable of being used while in New Hampshire coastal waters and ports. For the purposes of this paragraph "cruise ship'' means any vessel which is capable of providing overnight accommodations for 500 or more people. Residents are allowed to possess gambling devices that are over 25 years old, so long as they are not actively used for gambling. In February 2013, a fight broke out at a senior center over a bingo game. Siblings Annie Duke and Howard Lederer grew up in Concord, New Hampshire.